Kala Patthar Trek - Everest Base Camp's Famous Viewpoint! Kala Patthar Trek – EBC’s Famous Viewpoint! The Kala Patthar Trek is not so much a trek itself, but rather an optional short hike on the Everest Base Camp trek. It is a short, typically few hours add-on that ascends Kala Patthar, a hill that provides the best viewing point of Everest Base Camp and the surrounding peaks. Meaning ‘black rock’ in English, Kala Patthar stands at an impressive 5,644m above sea level, making it the highest altitude reached on most EBC treks at over 300m above Everest Base Camp. Its name comes from the colouration of the rock that make up its peak – a dark black that stands in stark contrast to the snow-capped peaks it surveys. Over recent years, the peak of Kala Patthar has become very popular among base camp trekkers who want the opportunity to catch a glimpse of the peak of Everest – a sight not visible from base camp itself. Because the Kala Patthar is an add-on hike, read our detailed route guides for the Classic Everest Base Camp Trek, Gokyo Lakes Trek, Jiri to Everest Base Camp Trek, Three Passes Trek and Island Peak Trek to see how the Kala Patthar add-on fits into the detailed itinerary of each trek. 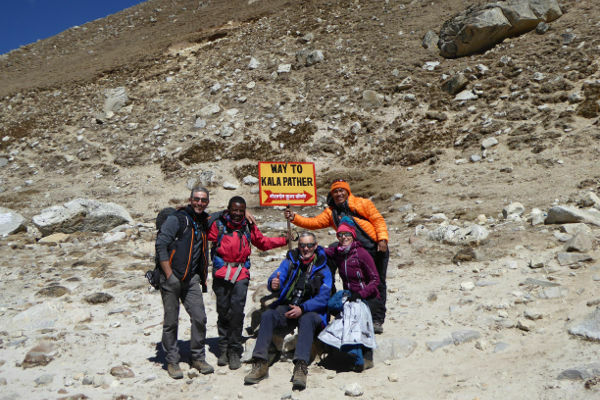 This article will touch on a few aspects of the add-on such as the route up Kala Patthar, the views at the summit and the difficulty of the trek. How do I check if this add-on is included in my trip? How long will it add to the typical trek? Will I need any extra gear? Does the high altitude pose a risk? Will I need to make sure my travel insurance covers the hike? Sunrise or sunset hike up Kala Patthar? 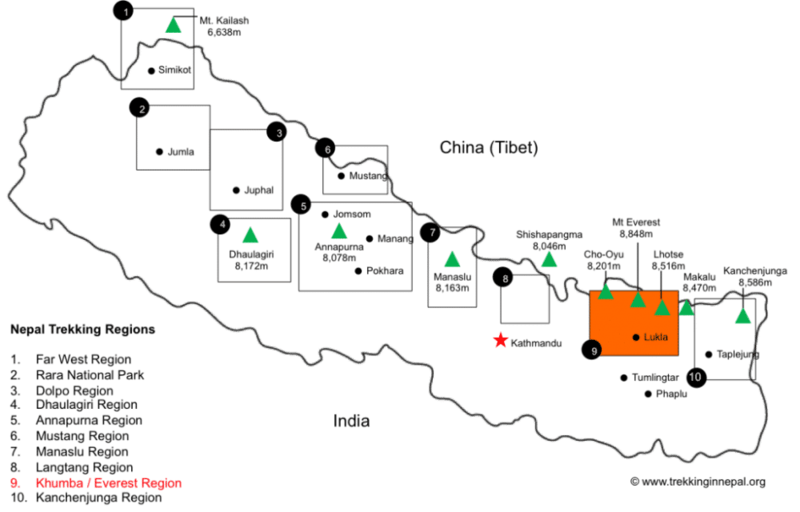 The Kala Patthar trek occurs in the Everest or Khumbu region of Nepal, as shown by the orange block in the map below. While being the high point of most treks, Kala Patthar is also the northern-most point, situated very close to the peak of Pumori, north-west of the Everest peak. The Kala Patthar Trek can be seen on the route map below as the short dotted line heading north-west from Gorak Shep. It is an up-down trek meaning you follow the same route as you ascend and descend the peak. The return to Lukla from Island Peak is relatively quick as you descend through Chukkung, Dingboche, Tengboche and Namche Bazar before reaching Lukla where your flight will await you. The trek begins in the village of Gorak Shep, the highest altitude at which you will be sleeping on most treks in the region. 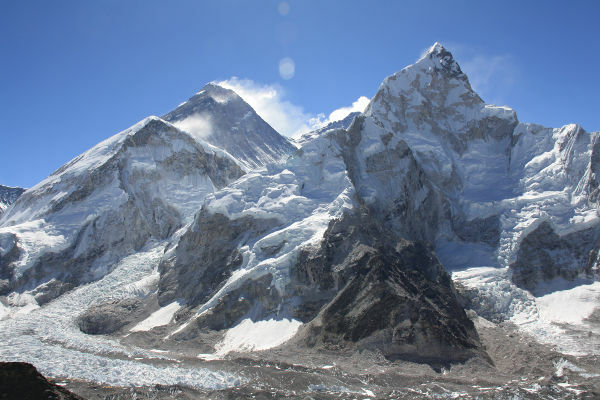 Typically, you will visit Everest Base Camp on the same day as you arrive in Gorak Shep as tour groups are not allowed to stay overnight at the camp. The sheer number of trekkers that visit base camp each year make it impossible to allow them to stay the night. An early morning start to the next day will see you complete the 2-hour hike up to the summit of Kala Patthar. The morning hike is the most common as it allows the rest of the day to be spent descending back down to Dingboche, but the sunset hike has been known to provide stunning views of the peak of Everest. Cloud cover is more common in the evening and you also run the risk of hiking in the dark, so the morning hike is generally preferred. The trail starts with a short drop into and ancient lake bed before heading uphill up the eastern side of the mountain. The gradient of the mountainside increases as you near the summit. Once there, you will be presented with the view of many prayer flags and of course the magnificent backdrop of Everest and the surrounding peaks. If you can bear to brave the cold, biting winds, you can whip out your cameras and snap some pictures of the iconic view – one that is permanently documented by the world’s highest webcam. After 30-60 minutes spent at the top, you will head back down the same ridge, through Gorak Shep and even further as the usual day will end at Dingboche as you make your way back to Lukla on the home stretch. 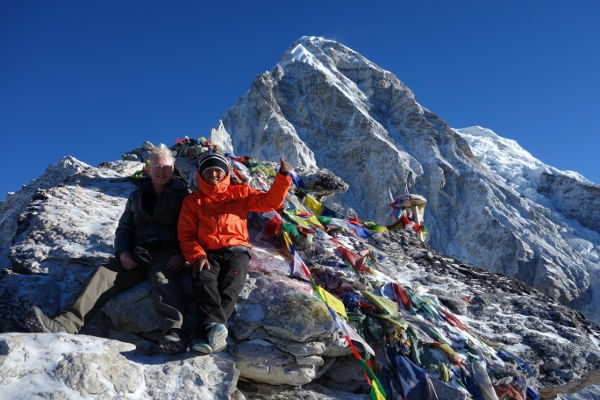 Most tour operators will provide a detailed itinerary of their Everest Base Camp Trek in which you will be able to see if they have included a Kala Patthar add-on. The majority of operators nowadays will include the trek because it has become one of the highlights and most popular picture opportunities of the classic trek. The Kala Patthar hike is about a 3-4 hour return trip so not very long. Most tours will do the hike early in the morning of the first day of descending back down to Lukla. No, the Kala Patthar hike does not require any extra amenities, meals or accommodation so it comes at no extra cost. No, the gear used on the classic trek is suitable for the Kala Patthar add-on. Read our detailed packing list for more information on what clothes and equipment to bring. By the time you reach the Kala Patthar hike you should already be very well acclimatized due to the structure of the base camp trek. Although Kala Patthar is the highest point on most trips, you do not spend much time at that high altitude as you descend shortly after reaching the peak. Read our article on acclimatization and altitude sickness to know more. As we detail in our guide on finding the correct insurance policy, a policy that covers trekking of up to 6,000m will ensure that you are covered for all parts of the trek. At 5,644m the Kala Patthar peak is below the threshold, so you only need to worry if you plan to trek up some of the higher peaks such as the Island Peak. Most tour operators will take you on the sunrise hike for two main reasons. The first being that you are almost guaranteed clear skies which make for great viewing conditions and the second being that it allows the rest of the day to be spent hiking back down to Dingboche, where you will stay for the night. A draw back of the sunrise hike is that you might have the sun shining into your eyes as your face Everest. For this reason, some people prefer the sunset hike that will have the sun behind you. You do run the risk of cloud cover in the evening and you also don’t want to be hiking back to Gorak Shep in the dark. The main seasons to go are March-May and September-November. If you are looking to experience the hustle and bustle of Everest season then April-May is the best period. All the best!